The Green Party is campaigning to stop airport expansion in light of the upcoming decision being presented to MPs on whether airport expansion should take place at Heathrow or Gatwick. The Green Party believes that no decision can be made on where a new runway could be built until a full assessment has been made of whether this is possible, given our Government’s legal responsibilities to tackle climate change and pollution. On July 1st 2015, the Airports Commission recommended that Heathrow would be the best place for airport expansion to take place. But it also said that Gatwick presents “a plausible case for expansion”. The Airports Commission had previously been briefed by David Cameron to make recommendations on economic grounds for expansion in the South East. Early on it ruled out other options, including no new runway, and now it is presenting MPs with a choice between Heathrow and Gatwick. Decisions are due to be taken this autumn (2015) but the process is unclear. The Greens and NGOs concerned with the impacts of aviation say this is a false choice: the climate costs are just too high. Rather than committing the UK to an ever more intensive reliance on fossil fuels, Parliament should be looking seriously at how we transition to low carbon alternatives to maintain the UK’s connectivity. The Greens and many NGOs concerned with climate change are therefore calling for “no new runways” and asking MPs to vote for “none of the above”. 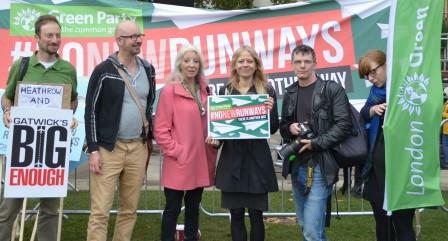 On September 12 the Greens organised a No New Runways event in London with many of the key campaign groups. We were delighted to have Sian Berry, the Green's London Mayor candidate, chairing part of the event as her first official engagement. Thanks also go to all the speakers for informative and inspiring talks. The resources from the event and campaign briefing materials all appear here on the My Green Party website (for Green Party members). There is a shorter campaign briefing here. Below you can view videos of some of the speakers at the September 12th event. Photographer Fiona Essex has invited you to view any other of the speakers from the event on her YouTube channel. Now (October - November 2015) is a critical time to write to your MP. Please can you help with that? See the briefing page. In the South East we really have to depend on our train services, especially if we commute into London. But the only things we really seem to be able to depend on is above inflation fare rises, year after year. Taxpayers still pay huge subsidies for our railways, but rather than the money being used to improve services and lower fares it just goes to make train companies’ profits bigger. We need train services that are affordable, reliable and comfortable. A quick look around Europe shows that publicly owned railways can deliver, fast and reliable trains services. Three quarters of you want our railways to be publicly owned, for the common good,” says the South East’s Green MEP Keith Taylor. “We need trains, there’s no competition—it’s an obvious candidate for nationalisation and Greens support that 100%. I support Caroline Lucas's bill to bring the railways back into public ownership.